Mr. Armstrong's appointment of his successor was the latest example of how God ha.s provided leadership for His people throughout history. 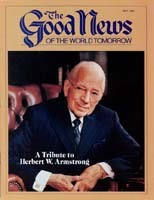 Though God has chosen to take the life of Herbert W. Armstrong, the first human leader of God's Church during this Philadelphia era (Revelation 3:7-13), both the Church and the Work of God continue on unabated. Jesus said the gates of the grave would never prevail against God's Church (Matthew 16:18). The announcement of God's coming Kingdom must still be made to all the world (Matthew 24:14). Disciples must still be made of all nations (Matthew 28:19). Jesus Christ, the living Head of the Church (Ephesians 1:22-23), is at the right hand of God the Father in heaven. He continues to actively lead and govern the Church through Mr. Armstrong's designated successor, Joseph W. Tkach. Mr. Armstrong termed his appointment of Mr. Tkach "the passing of the baton." It's interesting how a baton is passed. It is not passed to end a race, but to continue a race, with a temporary readjustment as the baton is handed from one runner to the next. Once the baton is received by the next runner, there is a speeding up. That's what's going to happen in the Work today! Readjusted, we're going to go on running with the baton that was given to Mr. Armstrong before us, with the teachings God revealed through him, using what has already been accomplished, building on the foundation and continuing toward the finish line. The Bible shows smooth and orderly transfers of human authority under God's government throughout history. Moses was a unique man called by God for a special job. He led the children of Israel out of Egypt to the brink of the Promised Land. Knowledgeable and qualified (Acts 7:20, 22), Moses did his job successfully, and yet God did not choose to let him lead Israel into Canaan. There was a passing of the baton — the job of leading Israel into the land passed to Joshua. Moses spoke to all Israel about this transference of power, just as Mr. Armstrong informed God's Church of his appointment of Mr. Tkach (Deuteronomy 31:1-3). Christ led Moses to select a successor to continue the job. How did Moses know he ought to select Joshua? God revealed it (verse 14)! In the same way, God led Mr. Armstrong to see leadership qualities in Mr. Tkach. Joshua had been on the front lines fighting battles (Exodus 17:8-10). Mr. Tkach has been in volved in spiritual struggles, working in the ministry for years. He has valiantly supported Mr. Armstrong and the Church. Did God bless Joshua? He led Israel through the Jordan River and to Jericho. They circled the city once a day for six days and blew trumpets. On the seventh day they circled the city and blew trumpets seven times — and the walls came tumbling down! God used Joshua in a powerful way to lead Israel. Joshua remained faithful to what he had learned under Moses, just as Mr. Tkach is determined to remain faithful to what he has been taught under Mr. Armstrong (Joshua 24:31). God used Elijah to witness to Israel that they ought to reject false Baal worship (I Kings 18). Likewise, Mr. Armstrong made people aware of the true God. But Elijah had a successor, as Mr. Armstrong did. His name was Elisha. Elijah put his mantle, symbolizing his office and authority , on Elisha (I Kings 19:19). Mr. Armstrong trained Mr. Tkach in the use of power and designated him to positions of responsibility in God's Work. II Kings 2:9 states that Elisha wanted a double portion of the Holy Spirit that had worked in Elijah. Why? So he could be like Elijah and do the work of El ijah. Elisha received the power of God and went on to perform a greater work (verses 13-14). God transferred the power and blessing of the office to Elisha. Jesus selected Peter to be the leading apostle (Matthew 16:13-18). Peter was to be the physical head of God's Church on earth, to carry the baton on after the death of Jesus, who laid the foundation and trained those Peter would use to proclaim the Gospel to the world. Mr. Armstrong trained many men, too, and now he has given the responsibility to Mr. Tkach to use these men to finish the Work. In John 14:12 Christ said those who believe in Him would do greater works than He did. A greater Work is yet ahead for the Church of God today! The common elements in the cases we have covered are: 1) God transferred the power from the original leader to a new leader. 2) The new leader built his leadership on the teachings of his predecessor. 3) God always blessed the work of the new leader. Joseph William Tkach, 59, served in the U.S. Navy, receiving a certificate in basic engineering in 1945. He then attended the Illinois Institute of Technology in Chicago, studying industrial management. In 1950 Mr. Tkach was hired by Hupp Aviation. Before resigning in 1963 to serve in the ministry of God's Church, he advanced to supervisor and obtained journeyman credentials. "I was threatened if I didn't come in on that Sabbath for a special meeting that I would be fired," Mr. Tkach recalls. "Upon coming home from church services there was a telegram waiting for me stating that I was fired. "Monday morning I received a telephone call from the personnel manager saying, 'Management would like you to come in immediately, as fast as you can get here. I didn't know what to expect," says Mr. Tkach. "But after arriving at the plant, out in the parking lot there were almost 2,000 people milling around on a wildcat strike because they heard I was fired. "You see, we serve a God who fights our battles for us. My job was given back to me." March 31, 1951 , Mr. Tkach married Elaine Apostolos, a native of Chicago. Mr. and Mrs. Tkach have a son and two daughters. Mr. Tkach was baptized on March 1, 1957, in Chicago, Ill., and began to assist the ministry in the Chicago churches. He was ordained a deacon Jan. 7, 1961 , and a local elder June 3, 1963. The pastor general helped establish churches in South Bend, Fort Wayne and Indianapolis, Ind. ; Rockford and Peoria, Ill. ; Davenport, Iowa; Grand Rapids, Mich.; Milwaukee, Wis.; Cincinnati, Ohio; and St. Louis, Mo. In 1966 Mr. Tkach entered Ambassador College, where he attended for three years before being assigned to serve in congregations in Southern California. In 1970 he began working in Ministerial Services. In 1974 he was raised in rank to preaching elder. Mr. Tkach was named director of Ministerial Services (now Church Administration) in July, 1979. That same year, Mr. Armstrong ordained Mr. Tkach an evangelist and named him associate pastor of the Pasadena Auditorium P.M. church, pastored by Mr. Armstrong. A personal assistant to Mr. Armstrong, Mr. Tkach was appointed b y Mr. Armstrong to the Advisory Council of Elders in 1981. "He taught us the importance of why we were called," Mr. Tkach says, referring to Mr. Armstrong." We are here to be trained. Now is not the time to throw up our hands and to quit. Now is the time to stand up and be counted to do God's Work. Remember, this is our life. "So as the chapters are increased in the living book of Acts, there should be no gaps, but merely a marker of faithfulness to help us start where Mr. Armstrong left off. This is the legacy that has been left to us, to carryon with the Work. We have an awesome responsibility."